If you’re planning to head down to the South Coast or if it’s at least one thing you may do, then it’s worth heading to St Lawrence Gap to sample the vibrant nightlife. And on a Friday night, you can’t miss the Oistins Fish Fry – a beach-side party with barbecued fish, calypso rhythms and dressed-up locals dancing the night away. Harbour Lights Night Club is one of the most famous party destinations in Barbados and is long established. Harbour Lights is the hot spot after Oistins on a Friday night. 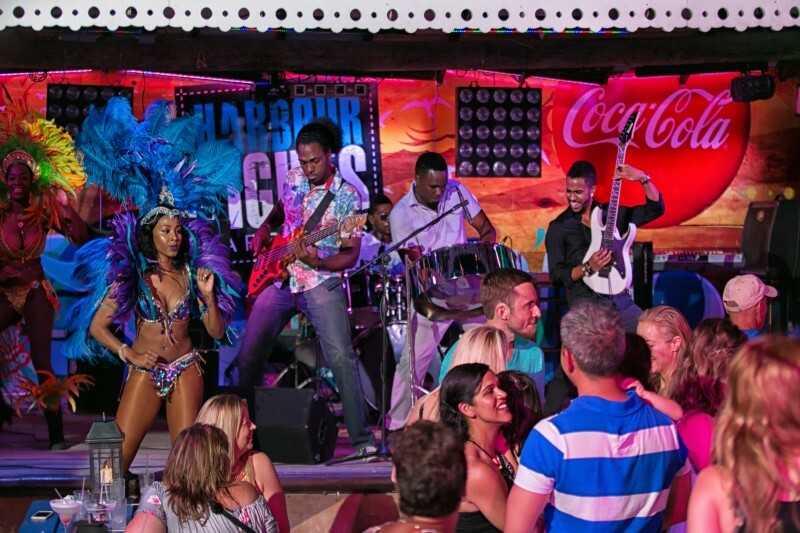 A favourite liming spot with locals and visitors alike, Harbour Lights mixes free drinks club nights with the hottest local and international music to provide the ultimate party fusion. Enjoy all Barbados has to offer with an amazing night partying on the cool sand and a drink in your hand! The night club DJ will keep the party going all night with nonstop hits until the sun comes up. Look out for our amazing shots specials on Friday nights at Lights - the only place to be! Dress code in effect. At no time will Camouflage or low waist pants be acceptable. No vests or head gear on Wednesdays or Fridays. If you are thinking about where to eat in Barbados with great food and amazing entertainment then the Harbour Lights Beach Extravaganza Dinner Show is for you! The evenings are Monday & Wednesday and will undoubtedly be a fantastic night for all ages. Imagine dancing barefoot in the sand under the coconut trees to the pulsating beat of a top local band, sipping exotic drinks, feasting on a delicious Bar - B -Que dinner and just being able to enjoy the absolute best in local entertainment. The evening gets underway as the live band jump starts the night with the sweet sounds of calypso music to set you in the mood for a high-energy evening. The amazing performances of the stiltmen, the fire eater, the acrobatic green monkey and shaggy bear keep you on the edge of your seat while the infectious beat of the tuk band and the scintillating moves of the limbo queen all add to the excitement of this authentic Bajan evening. The most recent addition to the line-up of entertainment is the dynamic steel pan band 'ZigE" led by the talented and energetic artist Ziggy Walcott who is accompanied by beautiful stage dancers. The dress is casual so you can unwind throughout this simply entertaining evening. Best value for money, not to be missed! · 7:00 p.m. – 10:30 p.m.
· Drinks Free until 12:00 a.m. Many have been to the now famous drag show on a Sunday night, with Mannequins in Motion, and all can honestly say they have never laughed so hard. I know it sounds weird it is priceless. Such good fun! Food is basic but stereotypical of what you expect Bajan food to be.Most swear by the blackened catch of the day which is just delicious! Nice staff and great vibe! The divas are phenomenal!